Gotta start somewhere, so why not down the street at our neighborhood pizza joint, Antica Pizzeria? I find myself dining at this peach of an eatery a few times a month, sometimes with Guy, sometimes with girlfriends. So, far I’ve never been disappointed. First of all, Mario (pictured right), the owner is awesome. I get the old one, two, Ciao, Bella! double cheek kiss every time I walk through the door. It’s BYOB, which always scores points in my book (though I might advise that you pick up a bottle or three on your way – the place across the street, though convenient, has a pretty limited selection). Half the time I go there, I end up sharing drinks with the tables around me like we’re all a big Italian family. It’s a warm and fuzzy neighborhood place and when I’m there, I feel like part of the community. A single tear trickles down my face. Seriously though, check it out. They’ll make room for you. Mario might even join you for a glass of wine. He prefers red. Oh, and while you’re there, might I make a few recommendations? There’s no shortage of accolades for the Neapolitan style pizza. In case you’re not familiar, that’s the kind that’s cooked in a wood burning oven. The crust is thin and crisp. Each pizza is intended to serve one, but feel free to share. 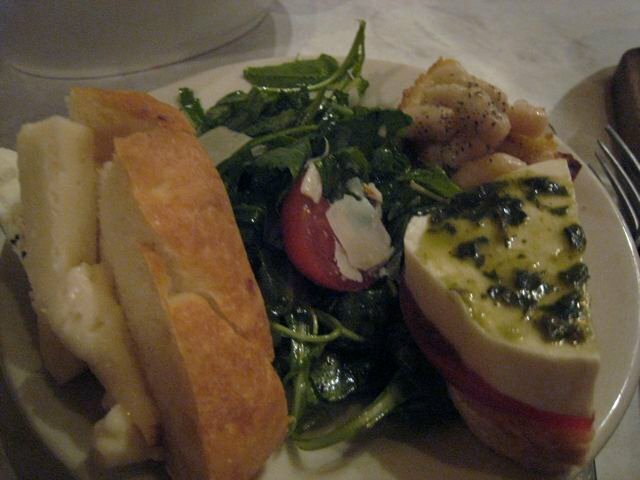 Parma is my favorite – I replace the prosciutto for capers, though generally Mario isn’t a big fan of substitutions. The bruschetta is also surprisingly tasty. I never order bruschetta (I think I overdosed in the 90′s), but Mario dropped a plate off for free and – hot damn – it’s really good. Like much of the menu, it changes seasonally. And finally, if you like truffle oil (I’d bathe in it if I could), try the Risotto Con Fungi Porcini. Really, I’ve never had a dish I didn’t like. Almost everything is homemade and lots of ingredients are imported from Italy. As with with most Italian places, there are lots of vegetarian offerings. Added bonus: he makes all the soups (so far in my experience) with veggie broth. Go Mario. The first thing you notice when you walk in to Antica Pizzeria is the warmth. 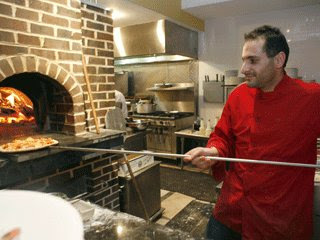 And that’s not just from the wood burning oven that’s cranking out those pizzas. It’s also the warmth of the owner, Mario, and his staff. Personal service is big here. Of course, I’m just going through my first Chicago winter now and about the only thing I’m looking for these days is warmth. Anyways, I’ve only eaten here twice, but I’ve loved it both times. Gal has been countless times, so the staff knows her right when she walks in. I think they look at me with questioning eyes—they love her and want to make sure I’m treating her right. And so I always leave good tips. I’ve gotten the pizza both times, and both times it’s been great. The crispy crust has hints of the smoke from the wood. The ratio of cheese, sauce and crust is perfect. The first time, the Quattro Stagioni, cooked with artichoke hearts, olives and mushrooms, then topped with prosciutto di parma. A salty treat, but each slice was a handful. The second, the good old Pizza Margherita, which was excellent in its simplicity. The most amazing dish I’ve had so far was the grilled calamari appetizer. I’d never had calamari grilled before, only the fried calamari you get at bar and grilles. I wasn’t sure what to expect, maybe something similar to the rubbery fried rings I knew. I was blown away. The texture of the meat was similar to the fried stuff, but I’d call it bouncy instead of rubbery. I know that probably sounds weird, but it had a mouth feel that I can only describe as exciting. And without the fried skin, I really tasted the meat, which was very tasty. I recommend this dish. So I think it’s safe to say that we’ll be back. If not, the staff might come knocking on our doors and drag us back anyway.